PERFECT PAIRING Channel Faulkner and New Orleans at Santa Rosa's Parish Cafe. When I moved to New Orleans 10 years ago I thought it would be a good idea to buy some William Faulkner. I had it in mind to spend the summer sitting in cafes reading the titan of southern literature, who wrote his first novel in New Orleans in the 1920s and lived there for a time. I'd drink coffee, eat beignets and read his short stories. The problem was, it took awhile before I even found a copy of any of Faulkner that wasn't half-destroyed by a student's yellow marking pen. I hit all the local used bookstores in the French Quarter and thereabouts, and struck out on the Faulkner everywhere I went. I finally bit the bullet and purchased a Faulkner short story collection at Border's. I told a friend over coffee and beignets one night at the legendary Café Du Monde that I thought it was kind of curious that even though Faulkner lived and wrote in New Orleans, that you have to go to the big (and now defunct) chain store to find a copy of one of his books. I thought my insight would render me an immediate local in her eyes. I was wrong. "Did you try Faulkner House Books?" she said. "On Pirate's Alley? Heart of the French Quarter?" "Oh. You mean there's a whole store devoted to Faulkner's books?" Jeez, who knew. But indeed there is—and the Faulkner store's pretty much a stone's throw from Café Du Monde. So I was very pleased when the Parish Cafe opened on Fourth Street in downtown Santa Rosa last year and started pushing out po' boys and other New Orleans fare. I just like the idea that it's there as a reminder of the life I left behind in New Orleans. One of these days I'm going to stroll in with some Faulkner under my arm and pick up that storyline again. They've got plenty of Faulkner at Treehorn Books just up the street and I could spend a whole summer just checking out the ever-expanding Chandi Hospitality menu of downtown offerings, starting with Mercato and ending at Bollywood. 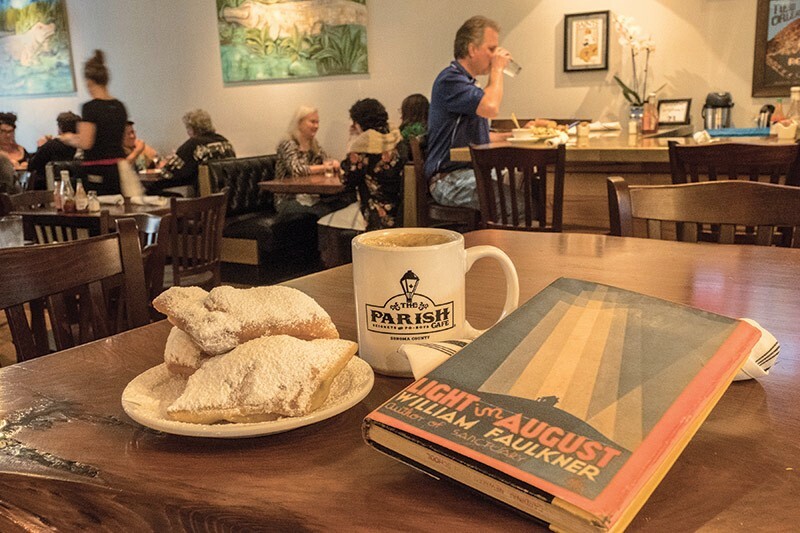 For now, I'm obsessing over the part of the Faulkner story where I told it to my friend over coffee and beignets (beignets is how the Parish Cafe got its start at farmers markets way back when). Beignets play a critical role in the daily life and functioning of New Orleans, maybe not as critical as the surrounding levees, but still. I learned living there that there's no bad time for a cup of coffee and a couple of sugary beignets, and that the combination is as totemic as it is delicious and bracing. So, it's 2am and the jazz just stopped playing? Time for a beignet. It's lunchtime and your energy is flagging but those deadlines aren't going anywhere? Grab a coffee and a couple beignets, and get on with it. You had dinner three hours ago, complete with bananas foster for dessert? Well, there's a difference between dessert and a beignet, and the two words should never be uttered in the same sentence. Coffee-and-a-beignet is its own thing, and it's not dessert.